Forex Impulse Trader is an automated forex trading robot (expert advisor). The main idea behind this strategy is to detect the impulse and to open two trades at the same time and in the same direction. There are separate take profits for both trades: FirstTrade_TP and SecondTrade_TP. When the first trade is closed with profit, then the robot sets take profit value to the second trade. The distance is equal to SecondTrade_TP parameter's value (in pips) from the close price of the first trade. Forex Impulse Trader support 6 (six) currency pairs by default. They are: EURUSD, GBPUSD, EURAUD, USDJPY, USDCHF and EURJPY. The best performing currency pairs are EURUSD and GBPUSD. 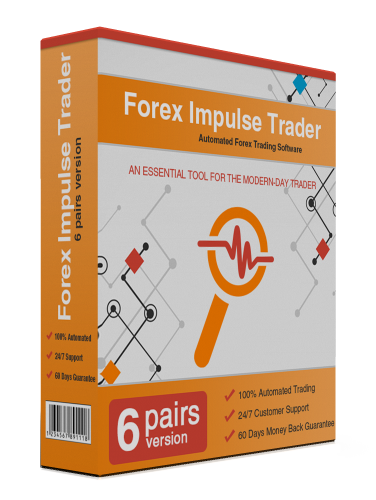 Forex Impulse Trader can be also used on other currency pairs but the settings of the robot should be optimized and adapted for these currency pairs. Recommended Time Frame is M15! Some of the parameters have 0 (zero) as default value. Since the robot supports several currency pairs, we have integrated the optimized values in the robot. The real values can be seen in the information box. If you want to optimize the robot for an unsupported pair, you have to optimize the following parameters: StopLoss, FirstTrade_TP, SecondTrade_TP, TradingHours, ImpulseLenght, SecondStartTrail and SecondTrailStop. Optimize one or max two parameters at the same time for better results. Our first and most significant recommendation for our customers is to trade with reasonable risk. Such risk is considered reasonable and it will not harm your account balance significantly when a large loss occurs. Depending on the type of the robot and supported currency pairs, our recommendations are different. In this case, a reasonable trading risk is not more than 2%. The second recommendation is for the minimum account balance. For Forex Impulse Trader very recommend to have at least $500 - $1000 account balance. Of course it is recommended to trade with a reasonable risk 1% - 2%. Third recommendation - always test the robot on a demo before you switch to real-money trading. We provide a limitless period for testing on a demo - take advantage of this! If you like the results after this, you may consider using the robot on a real account also. The GMT offset of your broker is very important and therefore please set it correctly. In case that you do not know how to set correct value for GMT, contact us and we will help you. Forex Impulse Trader has the below listed features and many other useful options. 100% Hands Free! No manual interventions required! Extremely easy to use, understand and setup. Protects you against unfair brokers and their techniques of deception. Can be customized and adapted to individual needs. Lifetime support and free updates for all Expert Advisors. When enabled the Recovery system successfully compensate the previous losses. It keeps you away from unsuitable market conditions (High Spread). With its unique and high-efficient trading strategy the robot has low drawdown. This is a one-time payment. You will not be required to pay any additional fees in future. You will be able to trade on 1 real and 2 demo accounts with this license. There is a free option for trying the robot on 1 demo account.